White Horse by Camelot Homes, located in North Scottsdale, AZ, is a collection of modern luxury homes. At White Horse, living is not confined to just the indoors. The boundaries between the indoor and outdoor spaces are blurred, enhancing the enjoyment of both environments. 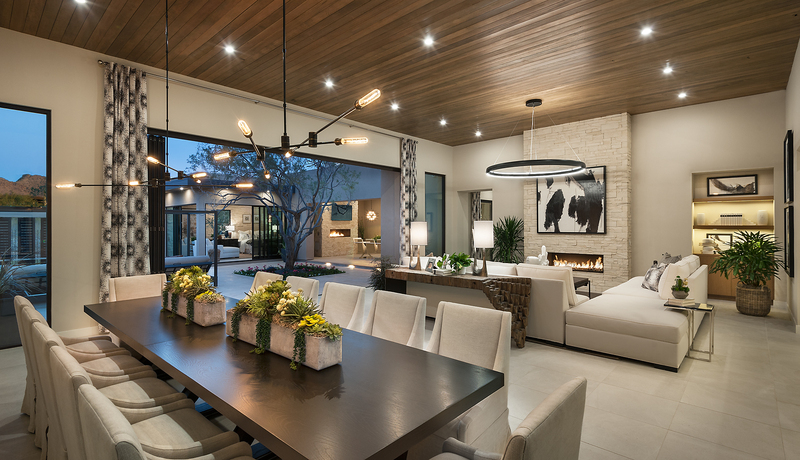 The Cavallo residence, Gold Nugget 2018 Award Winner of Best Indoor/Outdoor Lifestyle, of White Horse embraces Arizona’s desertscape with its desert contemporary elevation. To match its exterior, the interiors are contemporary with desert elements. The neutral color palette of charcoal, bronze, vanilla and a mixture of textures, such as wood, leather, stone, brick, and sand gives the home a luxurious, yet comfortable feel. Have you heard? We have a residential design division! Contact Jill Mitchell at jmitchell@pacificdimensions.com today to learn more about our services!